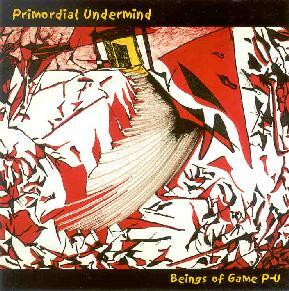 Primordial Undermind - "Beings Of Game P-U"
It's not often one gets to review the new release by a band he or she used to be in, but here goes... when Primordial Undermind's leader/guitarist/singer Eric Arn's academic career took him from Stanford University in the San Francisco Bay Area to the University of Texas in Austin, he once again had to recruit a new band from local psychedelic lumiaries; even long-serving Undermind second guitarist Brian Craft, who had played with Arn in Boston, Los Angeles and Bay Area Undermind lineups, stayed in California. The key ingredient of the new band is lead guitarist Tom Carter, formerly of excellent psych/stoner rockers, the Mike Gunn, and currently in the (mostly-acoustic) folk/psych/ambient duo or (sometimes) trio, Charalambides. 'Beings of Game' was recorded live, mostly improvised (although some of the instrumental themes, such as the dramatic "Filament", are recognizeable from the Bay Area Undermind's last few rehearsals), by Arn & Carter with Travis Weller on violin & electronics (most admirably and excellently replacing this reviewer!) and drummer Jared Barron. "Uva Urtana" opens the album with spacey improv far more amporphous than anything on the band's previous three albums, where guitars swell, moan and drone over subtle waves of electronic noise, occasionally punctuated with percussion. After that, the band returns to its expected heavy psychedelia with "Glass/Spitt/Revelation", and Tom Carter's loud electric (a variety not heard from him since he left the Mike Gunn) guitar prowess begins to fully assert itself, with some serious crunch and violin/guitar leads blending in and out of each other. The album continues with a haunting eastern-style drone "Louse Dances For Laos" and some processed sound-of-lab-equipment ("Mercury Shitstorm"). "Filament" demonstrates that some important lessons in melody and dynamic were passed on to the band by Japan's Overhang Party (who 'Undermind opened for on a '99 tour (CLICK HERE to read review); this is a powerful piece, where a moving violin melody can lead into the heaviest of dramatic power chords. Things come to a close with "Liquid Facets", a pleasently-melodic lingering afterthought. All in all, a great successor to 'Universe I've Got' that shows a band continuing to evolve and improve. Contact via snail mail c/o Camera Obscura Records; PO Box 5069; Burnley VIC 3121; Australia.